Can I make something with leftover strips from other projects, one long strip of batting, and assorted leftover binding? That was my question when I went into my quilt room today. I had recently read (yep, I read quilt books cover-to-cover!) 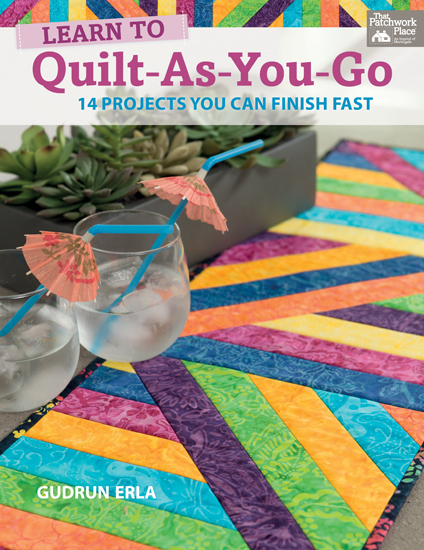 a book by Gudrun Erla entitled Learn to Quilt-As-You-Go (which Martingale sent me for review) featuring 14 beautiful projects. I thought that this would be a great time to make one of them as I only had a couple of hours in my quilting room. 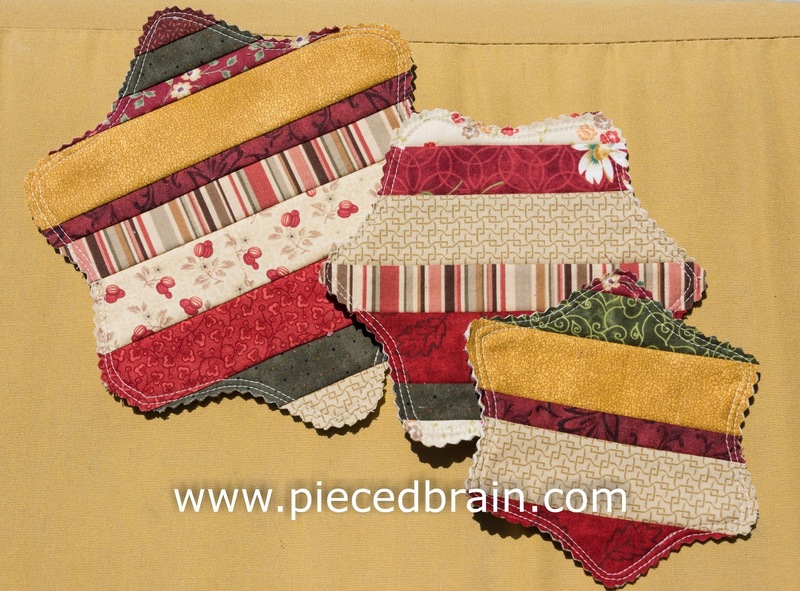 The first, pictured above, is a set of mug rugs which I am calling Very Berry. I still had the template from when I made the Berry Sweet Bags from Fig Tree & Co. (you can see the bags here) and knew it would be perfect for mug rugs. They measure 9.5" by 8.5". I am loving them! From the same long strip I then made this other set of mug rugs. There was no way I was going to bind those many curves... that is why I did the next best thing: first I topstitched about 1/4" inside the outline of the shapes, then using my rotary cutter with the wavy blade I cut on the outline, and finally I topstitched again. The largest measures 9.5" across, the medium size measures 7.5", and the smalles one is 6.5". Aren't they amazing? I have some orphan blocks and a lot more strips which I will turn into wall hangings, table runners, place mats... perfect as gifts, too. 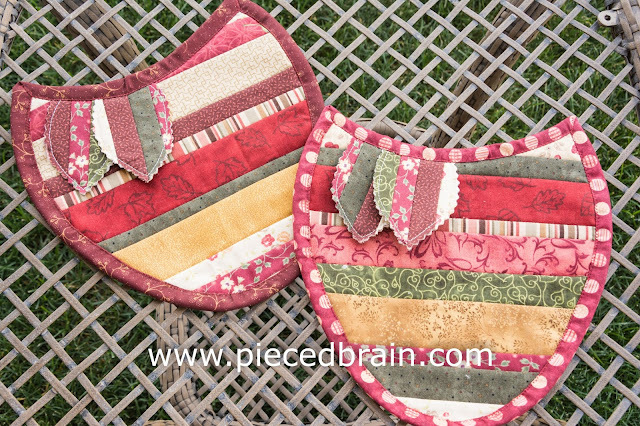 I am thinking I will wrap the mug rugs up and put them under our Christmas tree! What do you think? Very clever and looks like lots of fun! Looking forward to seeing your next QAYG projects! 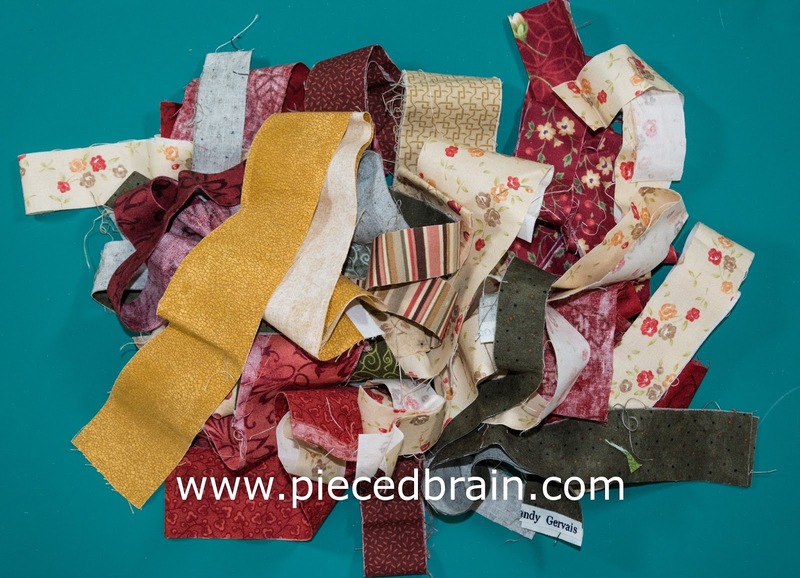 Have a wonderful, quilty day! Great ideas. I'm going to make some ho tpads using your non- binding method! thanks. Those are all amazing! Great ideas.